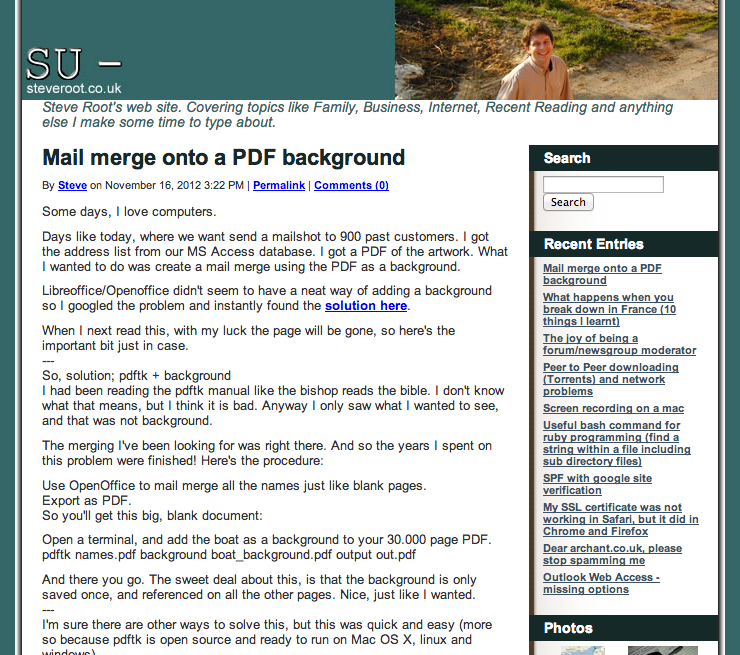 Finally I’ve got around to updating my blog from MovableType to WordPress. If you’re looking at this today (and maybe for another month.. or year) you’ll see the template is still the default WordPress template. Eventually I’ll update it but for now at least the content from all the old posts is still visible. 1) Spam. There was too much comment spam. Most didn’t get past the spam filter but every attempted post was a load on the server. At times the server was overloaded by spammers trying to post. The anti-spam features stopped almost all of them but it was annoying me. I say this knowing there’s probably even more spammers trying to break WordPress…. Each vhost can only have one domain pointed to it. Although I’ve got the WordPress Network working by using symbolic links and actually this might make my spread of domains and subdomains being used somewhat neater (I have lots of vanity domains pointed here, steveroot.co.uk/com/sroot.eu). I only get one login (so where I used to host a few friends and gave them SSH access to upload their files, I can’t do that any more because they could access all the sites and accidentally break something. Note that only applies for those that need to upload things, where they login through a web interface like with WordPress I can still host that for them, or they can send me the files they want uploaded like my sister in Australia does.). 4) A lot of friends are using WordPress for different things. I’ve had to use it for a couple of community/charity projects I’ve been involved with so I thought I might as well learn how to use it full. I actually had it running on the old server too but just as an experiment a year or so ago. Next post – some notes on the migration method. 1. Useful Windows Shortcut key to show Desktop is still number – This was written for XP but the shortcut works in Vista too. 2. Margins and Markups – what the difference is and how to calculate them. 4. BBC iPlayer and it’s built in Kontiki software – though I must make a new entry about this, as the iPlayer has moved on since 2 years ago. We’re now watching iplayer via our Ninendo Wii! Nicola used it to watch Gavin and Stacey for the first time to see the kitchen I designed (it’s the maple one, in the house set in Essex). 5. Welcome to the Christmas Party season – a review of our 2007 works christmas party.